KINGSTON, Jamaica — Ashanti Moore and Kevona Davis produced blistering times over 100 metres at the Boys and Girls Champs 2019 on Friday night at the National Stadium. Moore of Hydel won the Class One 100m final in 11.17 seconds, while Davis of Edwin Allen flashed to 11.19 secs to retain her Class Two title. Sent about their business after a recall, following the false-start by Lashawn Haye of Rusea’s High, Moore separated herself from the field to just missed Veronica Campbell-Brown’s record of 11.13, set in 2001. Ockera Myrie of Petersfield High ran 11.51 for second place and Kayla Bonnick St. Jago High finished third in 11.68. Meanwhile, Davis also impressed in the Class Two race after she broke from the blocks to destroy the field – just missing her own record of 11.16, set to win the gold at Champs last year. A delighted Davis said she was always confident about her chances of winning, but revealed that it was a good feeling to deliver the points for her team, family and supporters. Chasing home the Edwin Allen star were Excelsior High’s Ackera Nugent, who finished second in 11.42 and Krystal Sloley of Campion College, third in 11.48. Also impressing on the day was Edwin Allen’s Tina Clayton, who stunned her twin sister Tia en route to slaughtering the Class Three girls 100m record. Tina rocketed from the blocks and dropped the challenges from her sister Tia and the rest of the field to improve her personal best with a dazzling 11.27 seconds, which smashed the 11.50 secs record of Shauna Helps, set in 2012. 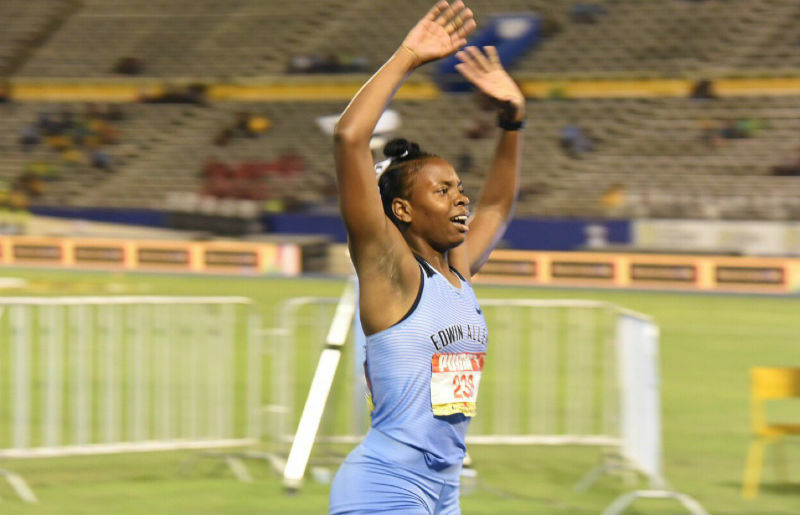 Her twin who entered Champs 2019 as the favorite, following her 11.32 seconds performance on March 16, had to settle for second in 11.60, while third went to Brianna Lyston of St. Jago in 11.61. In the Class Four race, Sashauna Smith of Vere won with a time of 12.28, getting the home ahead of Holy Childhood’s Abigail Wolfe (12.39) and Toniann Bryan of Immaculate (12.40). Champs 2019 will continue on Saturday’s final day and below are the links to stream live.